Moscow, Russia's capital city, is steeped in history and home to 20 million inhabitants. 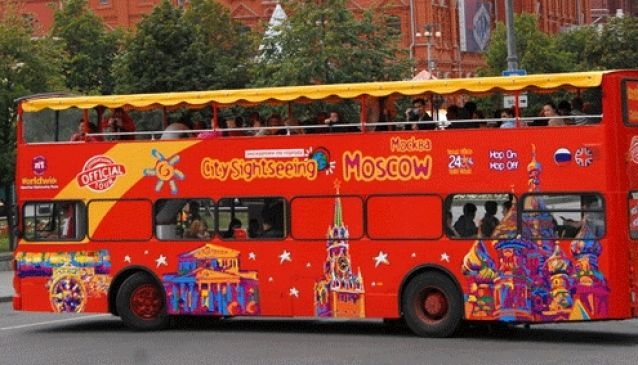 Hop on and off at key locations and explore Moscow at your leisure. The bus tour starts at Moscow's renowned Red Square which is home to the 16th Century St. Basil's Cathedral, one of the most famous pieces of architecture in the world, plus the constructivist pyramid of Lenin's Mausoleum. Travel over Bolshoy Moskvoretsky Bridge, a concrete arch structure which spans the Moscow River and connects the Red Square and Bolshaya Ordynka Street of Zamoskvorechye. The bridge's architect, Alexey Shchusev, chose pink granite as the facade to make the bridge look as if built by real rock. Absorb the history of Balchug street, one of the oldest Moscow streets outside of the Kremlin walls. Admire the unmistakable red brick factory of Red October which is situated on Bolotny Island in the middle of the Moscow River and has become an architectural icon.